Cleveland’s West Side Market is scheduled to re-open tomorrow with the completion of the cleanup after a fire did some damage a few weeks ago. I visited the market last winter and one photo that I took was of a glass window in a door with an interesting swirling pattern in the glass. 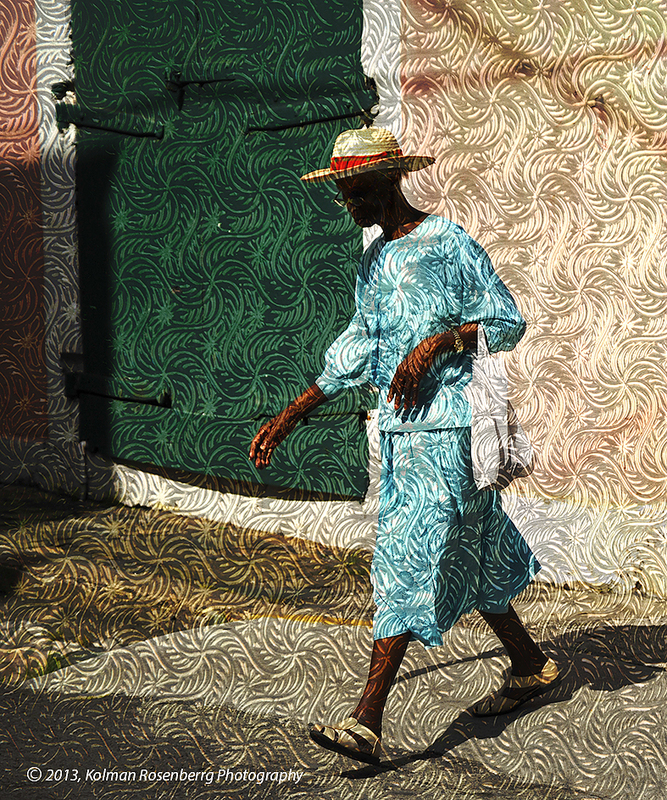 For this photo, I overlaid that pattern over an image of a woman walking from the market in Charlotte Amalie, the capital city on the U.S. Virgin Island of St. Thomas. I knew when I shot the window that I would use that pattern in combination with some other photo or photos. It was just a matter of time! Playing with photos today, I decided to give it a try, combining photos involving 2 different markets that are worlds apart! This entry was posted in Uncategorized and tagged Charlotte Amalie, Cleveland, composite, glass, OH, ohio, swirling, USVI, Virgin Islands, west side market, Westside Market. Bookmark the permalink. It appears that the two photo’s combined were meant to be put together, Beautiful!! I don’t know Patricia. I’m trying to learn to identify photos that may work well together. I find it very difficult to think that way!